1989 saw the beginning of the Boxer Rebellion in China, an uprising against "foreign devils" who brought Christianity to China. Boxers is the story of Little Bao, who leaves home with a band of villagers trained in kung fu. They take on the forms of ancient gods when they fight, and this strength helps them fight the foreigners and the Chinese who have converted to Christianity. One such converted Christian is Vibiana, whose story is told through the accompanying volume, Saints. 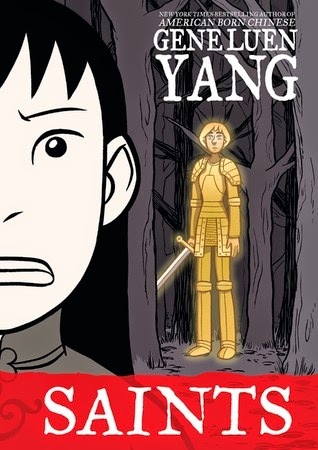 Known only as Four-Girl by her family, she becomes acquainted with Christians and is further encouraged by her visions of Joan of Arc, ultimately becoming just as enmeshed in the violent rebellion as Little Bao. These two graphic novels come together in a boxed set and though they are technically two separate books I'll consider them together. Before I heard about these books, I hadn't even heard of the Boxer Rebellion. Reading Boxers first, I think I got the basic idea of what it was about. When I began reading the parts about the men turning into ancient gods, I ended up reading the Wikipedia entry about the Boxer Rebellion because I couldn't trust this book as fact. Turns out, the Boxers actually did believe that spirit possession helped them to fight better. I really enjoyed Little Bao's story and the vibrant art. Saints was a little different. Vibiana was pretty unconvincing as a Christian so I didn't feel like she represented the Christian side of the story the way that Little Bao represented the Boxers. When she began hanging out with Christians, it was to get out of her house and because they gave her cookies. I never felt like she actually believed in the religion. But is that what the author is trying to say? That the Chinese people who adopted Christianity never embraced it fully? This volume was much shorter than the other and there was simply less story. It was disappointing after reading Boxers. 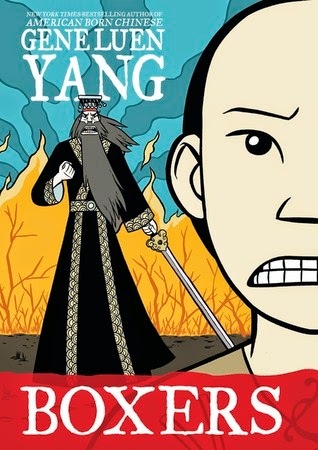 I looked forward to reading these as I enjoyed Yang's American Born Chinese so much, but only Boxers lived up to my expectations. Although collectively far from perfect, they tackle an interesting and overlooked historical topic and would be great for discussion. 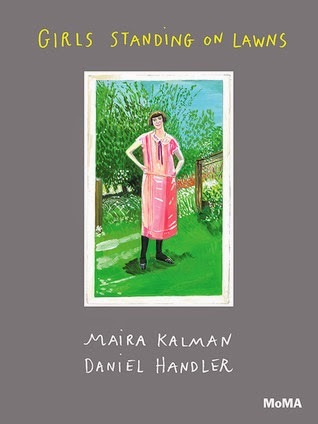 Daniel's parents have retired to a farm in Sweden, and he has yet to leave London to visit them but imagines them having a relaxed, idyllic life there. One day Daniel's father calls to tell him the sad news that his mother has been committed to a mental hospital. She has been having delusions of persecution and is accusing everyone around her of terrible things. Immediately, Daniel books a flight to Sweden, but before he can leave he receives a second call. It's his mother, telling him she's been released and is on her way to Heathrow, and that everything Daniel's father is saying is a lie. Caught between his parents, Daniel now must decide who to believe and what is the truth. 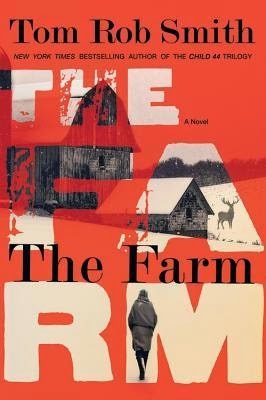 Most of this novel took place over just a few days, the bulk of it one long conversation between Daniel and his mother as she told the story of everything that happened in the several months since they bought their farm. She has a satchel of evidence, and pulls out each object one by one as she tells Daniel her story. Awkwardly, they are at Daniel's apartment where he lives with another man and he knows it's time to finally reveal this part of his life, but how can he in the midst of such a dramatic, urgent situation? Although Daniel's relationship isn't quite pertinent to the story, it adds an extra layer of tension. The construction somehow made it easy to just keep going and going - one doesn't want to stop in the middle of a conversation - and I just couldn't put it down. I stayed up past midnight on a work night reading, and that is little short of miraculous because when I read in bed I usually fall asleep after about 5 pages. I also kept expecting things to become clear enough to decide whether or not I believed her story, but Smith didn't make it that easy for me, and that, too, propelled me along. Ultimately, I consumed this book in less than two days. The descriptions I had read of The Farm were pretty vague, basically what I told you above, and I think it's best to keep it that way. It's all about experiencing the story as Daniel experiences it. I found it completely compelling and satisfying. It would be great for a book group - I'm dying to discuss it with somebody else who has read it! Tom Rob Smith is an incredibly talented writer, and I've extolled his virtues previously as I read the Child 44 series. While this is a complete departure from that series in both style and content, it only illustrates the range of his talent. I'm eagerly awaiting what he has in store next. Cadence Sinclair Eastman has grown up in a wealthy family and spends her summers on their private island off the coast of Massachusetts. She is close to her cousins, Johnny and Mirren, and two summers ago was beginning a romance with Gat, the nephew of her aunt's boyfriend. But something happened that summer that Cady can't remember. There was an accident from which she still hasn't recovered, and this summer she returns to the island and through the haze of her migraines she tries to piece it together. On the surface, Cady's life is pretty sweet. I mean, her family owns an entire island. Cady's mother and both of her aunts each have their own large house on the island, while her grandfather, the patriarch, rules over this domain from his own large house. They all come to the island every summer, their regular lives fading off into the background for those few, magical months. But just like any family, they have their share of unhappinesses. Cady's father left them, an event she describes as him shooting her through the heart (and indeed, her narration is filled with bloody metaphors). And of course, this mysterious accident that nobody will talk about, but which seems to have changed her family somehow. Even her cousins and Gat aren't as bright and fun-loving this summer as they have been in the past. Whenever I read fiction in which somebody has memory problems after a traumatic event, I wonder how realistic it is. I know that our minds do strange things, but I'm never sure if it's the kinds of things portrayed in fiction. Nevertheless, the mystery and Cady's determination to figure it out propelled me through the story. Despite her head injury, Cady was a recognizable teenager. She was desperately in love with Gat and upset that he didn't contact her after her accident (never mind that she didn't try to contact him either.) She argued with her grandfather when she learned that the small animal statues in each of their houses were made from ivory, lecturing him about the evils of hunting elephants. She also remained so wrapped up in her own life that it was hard for her to see what was going on with everyone else. I like the relationship between Cady and her grandpa. It wasn't a great relationship in many ways, but he still came across kind of positively. His problems with dementia mirrored her own memory problems and I found it quite sweet the day they took the boat to Edgartown for fudge though neither of them were supposed to be boating. It was like their own tiny little conspiracy. This was probably the quickest I've ever raced through an audiobook, because I just had to find out what was going on. Then I just wanted to talk to everyone I knew who had read it - it's just that kind of book. 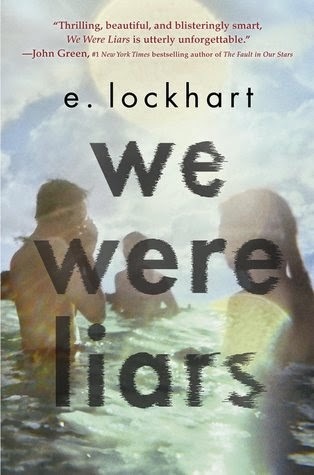 It's very different than the one other book I've read by E. Lockhart, The Disreputable History of Frankie Landau-Banks. This one is clearly more successful, but I think I prefer Frankie Landau-Banks, just out of my deep admiration of her character. Still, there is good reason this book is hot right now, so readers of YA fiction will not want to miss it. Louisa Cosgrove wants more than anything to be a doctor. Her father always encouraged her in her studies, even while her mother tried to turn her into a proper Victorian young lady. But Louisa's father is dead now, and she is being sent away to stay with the Woodville's. When she steps out of the carriage, however, she finds herself at Wildthorn Hall, an insane asylum, and the staff all call her Lucy Childs. Who has played such an awful trick on her? And how will she ever get out of this place? Everything in the description of this book sounded up my alley, but somehow when I began reading I initially felt like I had heard it all before. I've read a number of oppressed-Victorian-girl novels, including some wrongly-imprisoned-Victorian-girl variations and I love them, but will admit that for a while at the beginning of this book I thought "Oh, another one of those," and inwardly rolled my eyes a bit. But then I kept reading, and became ever more engrossed in this story, forgetting all about those other books entirely. It begins with the ride to Wildthorn Hall, and continues with Louisa's time there, but interspersed with the present are chapters beginning early in her life and jumping ever closer to the present so we can see the chain of events that brought her here. Helpfully, the chapters in the past appear in a different font, a style which I suddenly wish every book written with this construction would use. In these chapters, we get snippets of Louisa's life as a child, but much more from the past year when events conspired to bring her to her unfortunate present. It was easy to see from the start that Louisa's nonconformity would be a problem for her. As a child she was a tomboy, and in desperation her mother once invited over a family with a proper little girl in hopes they would become friends and, presumably, Louisa would learn from her. Instead, Louisa showed off her collection of specimens, which included a dead mouse, and then offered to test the other child's green stockings for arsenic. That was pretty much the end of the friendship, but it only made me like Louisa more. When she finds herself at Wildthorn she initially assumes it was all a horrible mistake, but slowly grows to realize she was committed intentionally. At this point the story only gets more interesting, as Louisa shows just how strong and capable she really is. 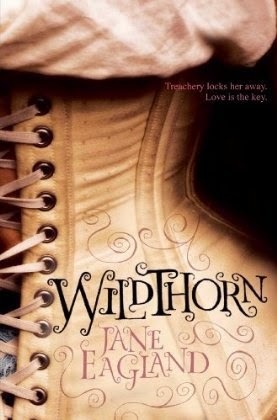 Wildthorn is a very satisfying historical novel about a young woman who refuses to conform. Anyone who enjoys a strong female lead in their Victorian novels will find a lot to like here. 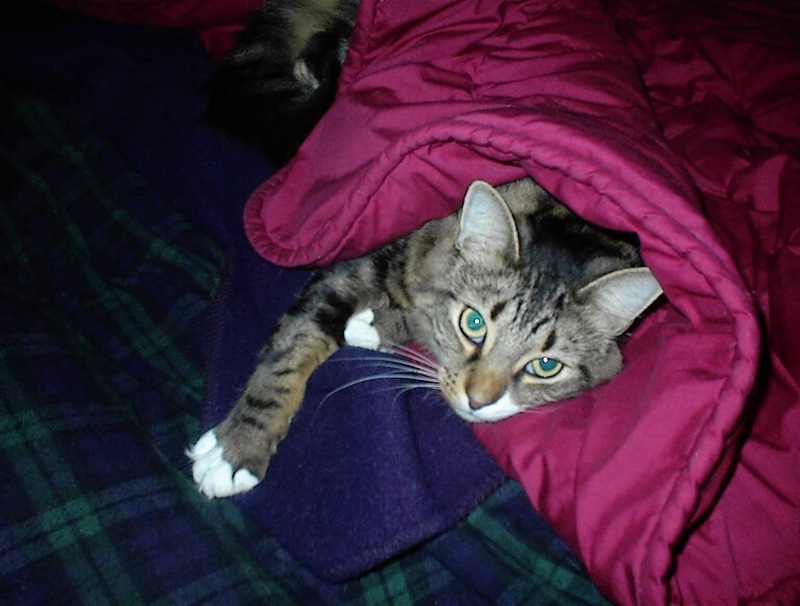 Way back in April I posted about some technical issues I was having, and as an aside mentioned that my cat was nearing the end of his days. He died about a month later in early May at the age of 18 1/2. I considered posting something, because I've posted any time one of my other pets have died, but I didn't know what to say. I kept putting it off and it's just been feeling more and more awkward. How can I summarize the 14 years that Clarence and I spent together? It's not even possible. My life has changed in so many ways over that time, and I've moved from job to job, apartment to apartment, and then finally to a house, and he was always there. Meowing and shedding, shedding and meowing. Following me around, begging to be petted, pawing my face, chasing his tail, eating the plants, puking in the hallway in the wee hours of the morning. It's been about a month and a half and I've mostly gotten used to him not being here, but every now and then I catch myself looking around for him. Here's one of the earliest pictures I have of him. Goodbye, Clarence! Ellen is married to a perfect man from a perfect family, the brother of her college best friend. Ellen is happy with Andy and with her budding career as a photographer. But one day on the streets of New York she runs into Leo, her ex-boyfriend, the one who got away. Leo is a journalist now and hooks Ellen up with a project-of-a-lifetime on which they work together. Even as Ellen and Andy decide to move to Atlanta to be near his family, she questions whether the life she chose is the one she should have. As in her other novels, Giffin has created a likable protagonist who struggles with very real problems. The tone is light - this is chick lit after all - but her struggles are complex and potentially life-changing. What I always like about Giffin's novels is that they aren't predictable. I really did not know whether Ellen would end up leaving her husband or not. Part of this is because Giffin creates characters who are so realistic. There are no good guys or bad guys here. Leo and Andy are both good people and they both have flaws. Just like Ellen, her sister Suzanne, and her best friend Margo. I love the audio versions of Giffin's novels because they are light enough to listen to on audio without missing a lot, but compelling enough to hold my interest. I recognized Kathleen McInerney from at least one other Emily Giffin audiobook, and I found her performance struck just the right tone for this first-person narrator. I've read or listened to all of Emily Giffin's novels now (except the new one that came out just as I was listening to this one). 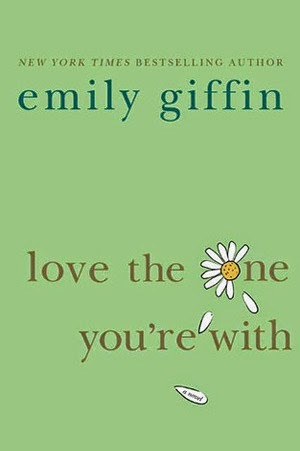 While Love the One You're With maybe wasn't my favorite, it still compared favorably with her other books and made my daily commute much more enjoyable. In the summer of 1926, Garnet Richardson is sent to stay at a resort with distant relatives to avoid a polio outbreak at home. She has looked forward to visiting a nearby amusement park and indulging in her interest in ornithology but her guardian, Mrs. Harrington, has very particular ideas about what activities are suitable for a young lady. Garnet already dreads what awaits her in adulthood - marrying and settling down to a dull life as a wife and mother - and she wants to enjoy this last summer of freedom. When she meets a flapper named Isabella, she feels she's finally found someone who understands her, but she must keep her new friendship a secret from her family who certainly wouldn't approve. Garnet is fascinated by birds, and everywhere she goes she carries papers and scissors to cut out silhouettes of each type of bird she sees. Although she is quite interested in the scientific aspects of birds, this craft is a more acceptable way to express her interest. Each chapter begins with a common and scientific name, along with a little silhouette, of a bird that appears somewhere in the chapter. Frequently, she compares people in her life to different kinds of birds, as though they are the only context through which she can understand the world. This short book is simple and spare in style, rather breezy, but still conveys the longings Garnet feels for a life she cannot have. She is weighed down by worry over her father, who is not recovering well from his experiences in the war, and the unwanted proposal she is expecting from a boy when she returns from her summer. Her dissatisfaction with her life only intensifies when her friendship with Isabella grows into something more. I liked that the the expectations Garnet was being held to by her family were not even based on reality. Many books in which young women are forced into a mold portray everyone around them as being perfect and the protagonist is the only one who doesn't fit. Here, Garnet could see just how unrealistic the expectations for her life were. Her father had mental health issues and her favorite aunt lived with a woman presumed to be her romantic partner. Garnet could see that some people around her didn't fit the sort of life that was expected, and I think this is a more truthful way to tell this kind of story. 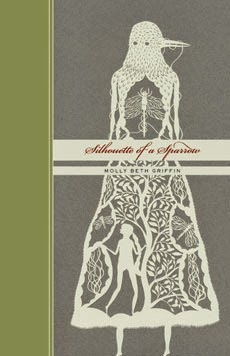 Silhouette of a Sparrow was a pleasant, quick read and though it probably won't really stick with me - even now my memories of its details are fading - I enjoyed the short time I spent with it. 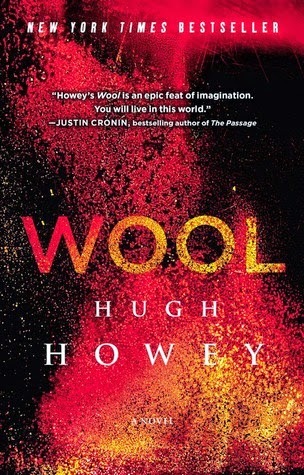 Hugh Howey self-published Wool a few years back and it got very popular by word-of-mouth until Simon & Schuster bought it and published all 5 parts together in one volume. And we all realized that publishing had changed. 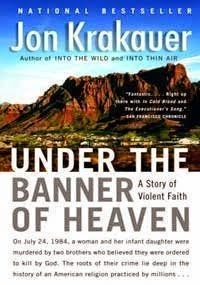 It's an interesting and inspiring story that got my attention, but ultimately that's not why I read it. Wool is probably my favorite kind of dystopia. An apocalyptic event has happened, society as we know it has transformed and adapted, and the book introduces us to this new society just when things are maybe about to change again. In this world, everyone lives in a huge underground silo, with well over a hundred levels of apartments, gardens, factories, and a big IT department. Screens on the top levels show the outside, a brown and barren landscape that is inhospitable to humans. When someone has committed the most serious crimes they are sent to "cleaning." This means they are sent outside in a suit that will only protect them for a brief time, and they clean the sensors to afford a better view before perishing in the toxic environment. Curiously, nobody has ever refused to clean when they are sent outside. The story begins with Holston, a sheriff whose wife was sent to cleaning a few years ago after she comes across some information she wasn't supposed to see. It made her raise some dangerous questions, and infected Holston with doubts. He now, in turn, has requested to go outside, convinced that there is more out there than they are being told. He's right, of course, but not in the way he believes. When seeds of doubt are planted, people revolt, and those in power need to quash any uprising before it destroys them all. But does that mean keeping the status quo, and keeping everyone in the dark about the world? A young woman named Juliette may have the answer. Wool was gripping from the very beginning and I read the entire 500-page novel in just a few days. I frequently struggle with science fiction because of poor character development or technical talk that I can't follow easily, but this was ideal. Howey created a vivid, detailed world that I was able to visualize and imagine myself in, and filled it with people who were recognizable and real and who I rooted for (well, in most cases.) It was about individuals and their actions, but also about how just a small bit of doubt can spread and cause huge societal upheaval. I think I loved everything about this book. By now, you've probably all seen the Slate article "Against YA" which maintains that adults should only read books written for adults. The tagline of the article is "Read whatever you want. But you should feel embarrassed when what you're reading was written for children." This article was clearly meant to provoke. It's the usual formula: the author proposes an idea they know will be unpopular so we'll all react to it, and we do. It's almost not worth even responding to. But as a librarian I feel a particular responsibility to emphasize what this author is so dismissive of: that we should all read whatever we want. I was going to respond to some of her points, but realized none of them matter. All that matters is that this person seems to think we should be ashamed of our reading tastes. So all I'm going to address is why that is simply wrong. Why do we read in the first place? Maybe to learn something new, to broaden our horizons, to step outside of our experiences, or to validate them. We read for fun, for pleasure, for entertainment. 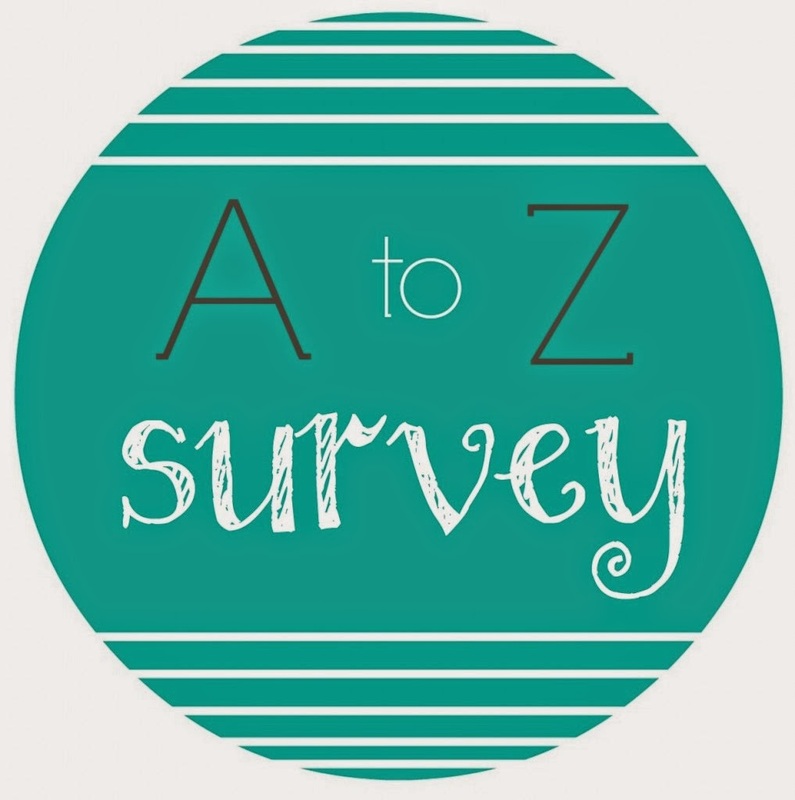 We all get something different from books, and if you're like me, you probably get something a little different from each book you read. I think most of us at this point believe that we shouldn't tell others how to live their lives. We're becoming more accepting every day of people having relationships different from ours, choosing whether or not to have kids, whether or not to go back to work if you do have kids, loving whoever you want of whatever gender, or identifying with a different gender than you've been assigned to. So why in the world would we think it's ok to judge people on something so minor as what sort of books they like to read? Nobody - especially not a stranger - can tell you what sort of book you'll get something out of. I've read young adult books that have made me look at life in different ways, and adult books that I found so utterly pretentious I couldn't get through them. Adult books that were completely trite and meaningless and poorly written - though, if you like those very same books I didn't, by all means go ahead and read them. That's why they're there. I've read picture books written for children that I found beautifully artistic and which reveal simple truths about our lives. Every book is a surprise and often you don't know if it's for you until you open it and begin reading. To me, reading only literary fiction written for adults is confining. Doing it only because that's what you think you should read means cutting yourself off from experiences that could be enriching, powerful, or transformative. In our lives we rarely walk such a straight and narrow path that we exclude anything that is simply enjoyable or piques our interests without adding some sort of educational or cultural value. (I mean, you've watched tv, right?) Why would it be any different with reading? If you truly enjoy reading your way through lists of books that have won literary prizes, then by all means carry on. But if you do so only because you think that's what you should do then you, my friend, are wasting your time. Don't be the person lying on a bed at the end of your life thinking, I should have traveled to Europe, I should have married that other person, and by god, I should have read the Harry Potter series. It is so easy to read what you want. Why deny yourself that pleasure? The truth is, even those of us who don't read young adult novels aren't all sitting around reading Proust. This article doesn't speak to different genres, but many have been maligned over the years. Chick lit and romance are big ones. Science fiction isn't taken seriously either, which is why those which are well-reviewed are rarely categorized as sci-fi even when they clearly are. Mysteries can be totally formulaic, and writers like James Patterson hire people churn out books like a factory. I can think of some young adult novels that I think are more worth my time than many of these, but it doesn't matter. Colin Eversea is about to hang for a murder he did not commit. At the very last moment, he is rescued by the beautiful mercenary Madeleine Greenway. Now he must race against time to clear his name and stop his brother from marrying the woman who is really meant for him. But when it becomes clear that someone is trying to kill Madeleine, the two become a stronger team than ever as they try to prove his innocence. As you might expect, this is all complicated by a growing passion both Colin and Madeleine are powerless to resist. The danger and intrigue set this apart from many period romances, and added needed tension and action. Otherwise, it was only ok. I have no major complaints but I wasn't especially invested in the romance between Colin and Madeleine. The main barrier between the two characters was his stubborn love for his brother's bride-to-be Louisa, and Colin remained convinced of his love much longer than I think he should have. He at least should have had some doubts when it became obvious that passion was brewing between he and Madeleine. He just kept assuming he still loved Louisa and was going to marry her. His romantic feelings remained too compartmentalized, even for me. Madeleine Greenway could have been more interesting than she was. She is a widow, having lost her family to smallpox and then lose their business as well, so she became a mercenary. The story of how she lost everything and then turned to this dark business would have made a great story, but we got only bits of it. As she began falling for Colin, she was just as resistant as he was, but her reasons were more unclear and possibly a bit neurotic. Perhaps this is better for people who are more into romance than I am, but it didn't measure up to some of the others I've read, like the two by Julia Quinn, or Texas Destiny, or A Lady Awakened. Romance is pretty hit-or-miss for me it seems, and for every one I find that I like I read another that I don't like very much. I wish I could figure out the pattern so I could make consistently wiser choices.